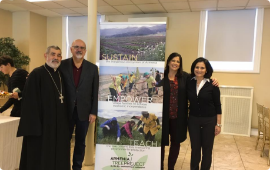 Supporters from all over the world have come forward to help sustain Armenia’s environment and empower its people to protect their land. 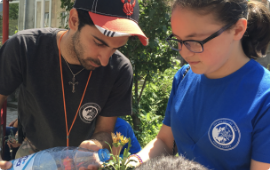 Our Ambassadors want to improve the environmental conditions in Armenia and believe in raising funds to help ATP achieve its mission. Join our team and help us garner more support to protect Armenia’s natural ecosystem. Interested in learning more about how to become an Ambassador for ATP, Sign up here and someone will reach out to you soon. WHY ARE YOU INTERESTED IN SUPPORT THE MISSION ATP? 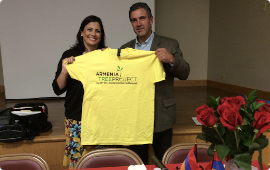 In 2016, Armen dedicated his 25th birthday to ATP, asking friends and family to donate toward his goal of raising $2,000 to support the planting of 100 trees in Armenia. Armen met and surpassed his goal! 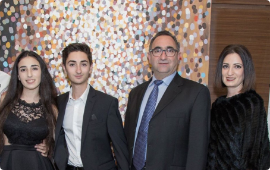 The entire Dirbadrossian family has volunteered with ATP for years and their son Peter starred in the 2014 ATP film Something New. Steve and his wife Debbie are longtime supporters of ATP and have been instrumental in outreach efforts in the Worcester, MA area. They’ve opened their home for a fundraising house party and invited ATP to present to community organizations they participate in. “Of all my humanitarian projects, this is the most meaningful to me. Together with ATP, I've launched a campaign to celebrate the survival and achievements of the Armenians from Azerbaijan. We will be planting a two-hectare forest in Talin, Armenia to celebrate our community and memorialize the killed and the bulldozed over graves of our loved ones." Community activist Anna Astvatsaturian Turcotte pledged to raise $15,000 for this project. Anna is asking Armenians worldwide to donate in memory of the martyrs, in honor of friends or family who fled Azerbaijan, and to remember the history of the talented, successful, and often forgotten Armenians of Azerbaijan. The forest will be named in honor of the Armenians from Azerbaijan, in recognition of the 30th anniversary of the anti-Armenian pogroms in Baku. Paul has donated $10,000 in support of establishing a Legacy Forest in Armavir Village. It is his wish to inspire other people to join him and actively participate in ATP’s tree planting efforts. He has also generously offered to plant a tree for every person that signs on with a policy at Legacy Partners Insurance and Finance Services, LLC.